The approach to Burgos is a lengthy one on pavement – good for cars but not so kind to weary feet that weep while walking. On either side, low-rent commercial and industrial buildings hem us in. We smell rubber and are surprised to see a Bridgestone tire factory. 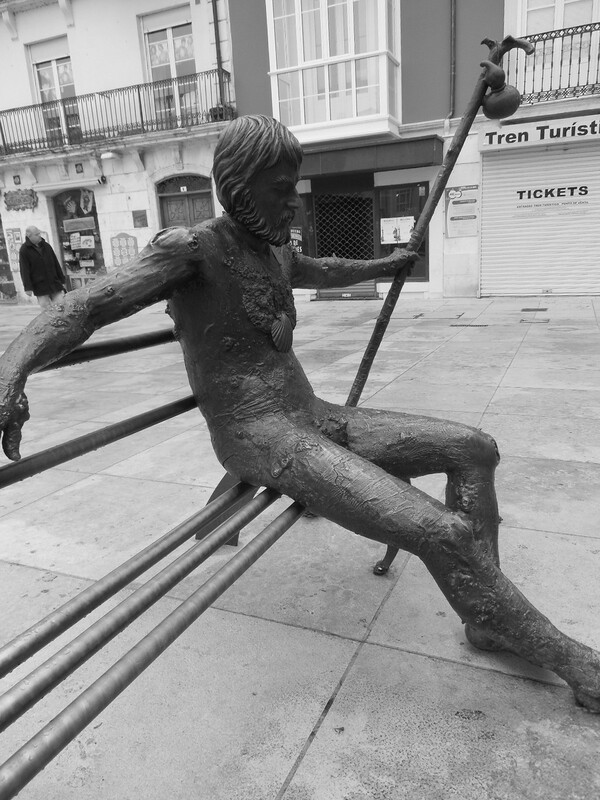 How perfectly the sculptor captured the fatigue of the pilgrim. s it is… I’m a poor excuse for a pilgrim. If a bus had passed by (or better yet a taxi) I would have saved my feet. Tired of dorm life in hostels, I am now alternating dorm stays with hotels. Furthermore, adding more sins to my growing pile, I have been guilty of sending my heavy backpack ahead by transport. How guilty do I feel? I feel some guilt, but not enough to make me change my ways. My rationale is this: at my advanced age, If I don’t strike a compromise, I won’t make it to Santiago de Compostela. Better to do what I can than fail completely. 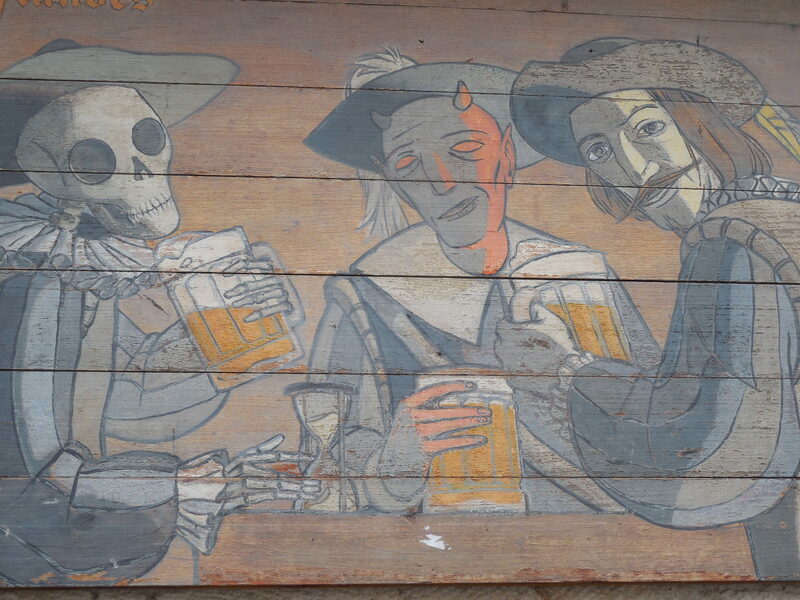 t is very possible that we were the first Americans to enter this bar. The regulars sat on bar stools. They gave me a hard look. I may have been the first woman to enter this all-male domain. A racy pin-up photo was partially hidden behind a clock. I could see one bare foot and a hand in close proximity. How exactly was she posed? I tried to connect the dots. We ordered two San Miguels. The barmaid showed me a small glass. No. I told her that I needed a large glass. She was pleased. I spoke Spanish and I drank full pints. I had won her respect. The beer was the best beer I have ever drunk. My feet instantly felt refreshed. Once we reached the central city, we forget the slog that brought us there. 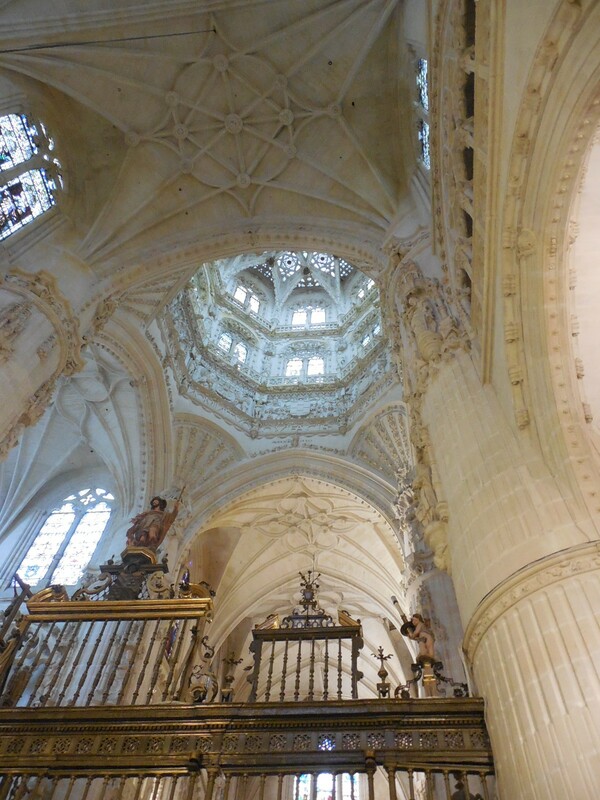 Cathedral de Burgos, a UNESCO World Heritage site, looms over the city and dwarfs those looking up in wonder – as was the intent of the church fathers: who are we (so imperfect, sinful and small) to not kneel before the majesty of The Church and all its teachings? The construction and ornamentation dazzle. Today’s architecture is more high-tech, but for the most part, the buildings stand alone: they have no story… no context. ide the church, the artistry is enough to make believers of us all. Surely a Divine Hand must be at work. It cannot be possible that mere mortals can have wrought such magic out of stone, wood and plaster. 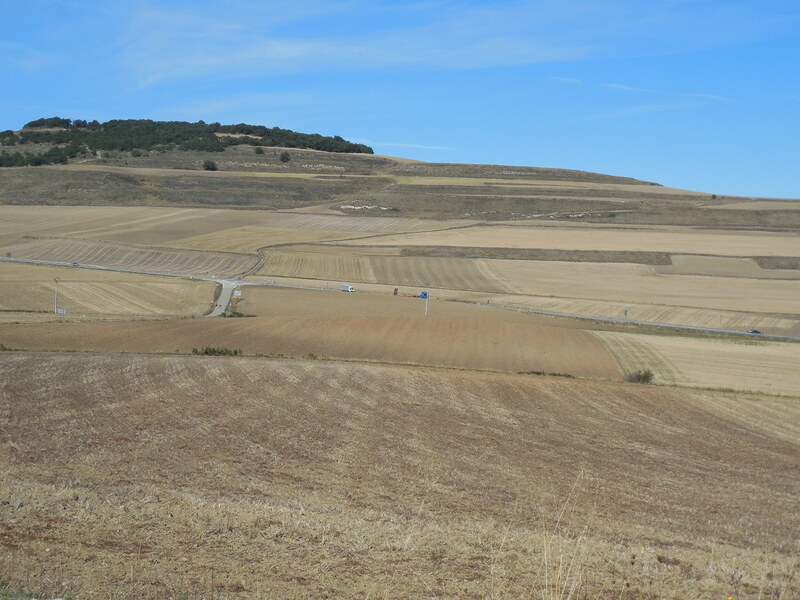 Burgos lies just east of the meseta. It will take us almost a week to cross this broad expanse of softly undulating farm land unmarred by fences. On a clear day… looking west… you can almost glimpse the Mississippi. The land rolls on to infinity. To one side, freshly plowed soil – fragrant in its freshness. On the other side, bright green winter wheat sprouting three inches high. Birdsong, irrigation water, and always the sound of a tractor or two keep us company. Pilgrims are dropping out. Despite the occasional bird chirp, we walk in silence… too tired to talk. 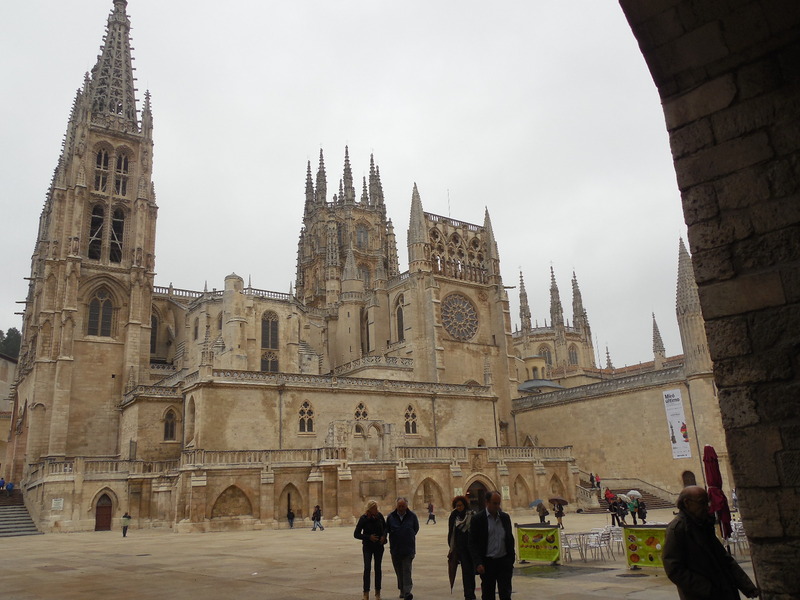 This entry was posted in Uncategorized and tagged Cathedral de Burgos, El Camino de Santiao, pilgrimage, UNESCO World Heritage site. Bookmark the permalink. Doris – I am so proud of YOU!!! Sending blessings to you and your tired feet and back. Dear Sherry, Despite the complaints about my fatigue and feet, it has been an amazing spiritual journey. Thanks for writing. Must say, Anne, that a beach in Laguna sounds wonderful. I think that a walk on the warm sand would work wonders on my fallen arches. You’re doing great. I wouldn’t even dare attempt it. A beer, hotel, & bus ride does not take away your wonderful walk.